Full House Floor CoveringsThis case study features a full house of new floor coverings, using a variety of different products to achieve a practical and stylish finish. As you enter the house through either the front or back door, the customer wanted to encourage people to wipe their feet so opted for a fixed natural yarn entrance matting. This matting is much more solid and effective than a throw down door mat, and can be cut to any shape and size to fit any entrance hall. The customer went for laminate throughout the downstairs of the house, our Dublin Oak which is an 8mm AC4 board. 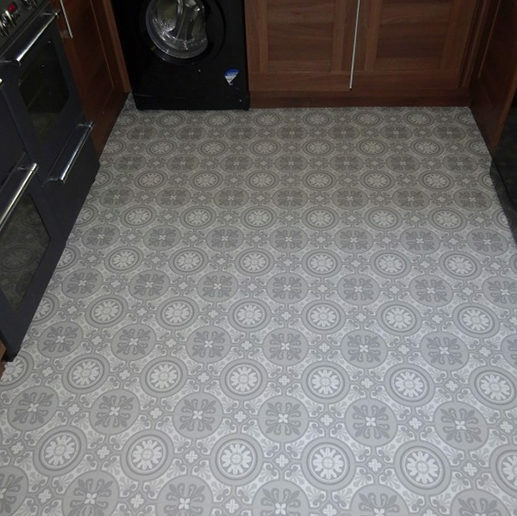 This choice was made as laminates are hard-wearing and extremely easy to clean, perfect for a busy working couple. The stand-out feature of the house has to be the FMF signature staircase, using the Dark Dublin Oak on the risers and the British made Soft Focus Cormar carpet on top… the soft grey carpet contrasts the dark wood perfectly. The same grey carpet was laid in all 3 bedrooms, giving you a luxurious feeling underfoot throughout the entire upper level of the house. Finally a dark slate effect vinyl was used in the main bathroom and en-suite, which tied in well with the grey carpets and was a very practical choice for wet areas. 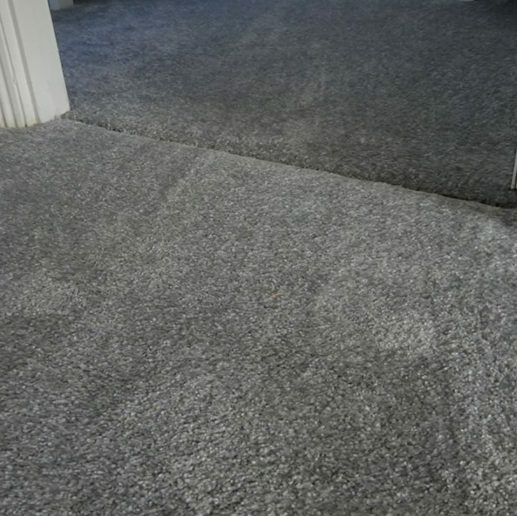 This case study showcases an entire house supplied and fitted by Merseyside Carpet Warehouse. 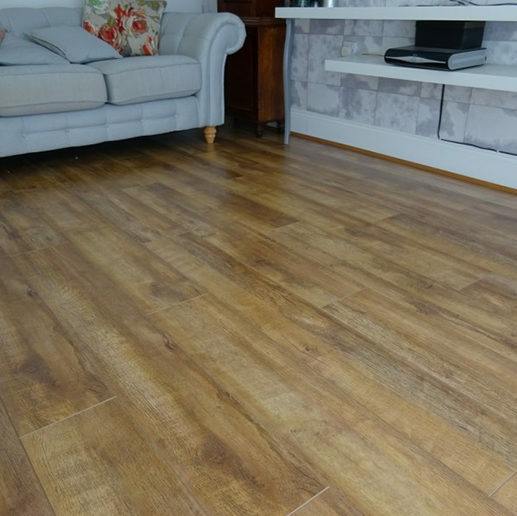 The majority of the downstairs floor is covered with our 8mm Harvest Oak Laminate which is an extremely popular choice with a lot of customers. The Laminate flows from the front door all the way through the hallway, into the two side study rooms and into the back living room – which gives a lovely flowing feel to the house. 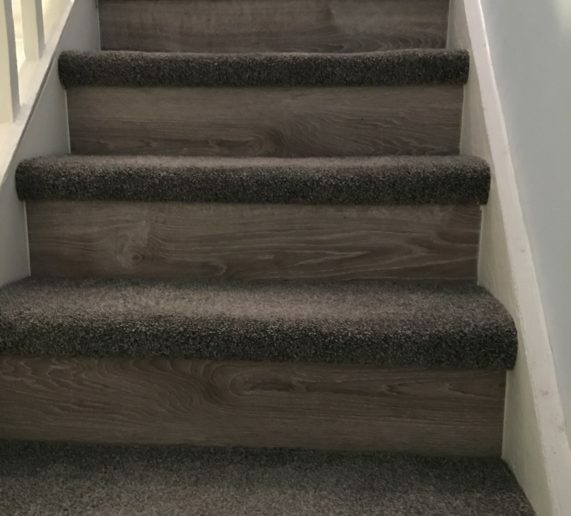 The same laminate is then used on the risers or the staircase with a nice thick grey carpet on top, fitting staircases like this is fast becoming our signature design. 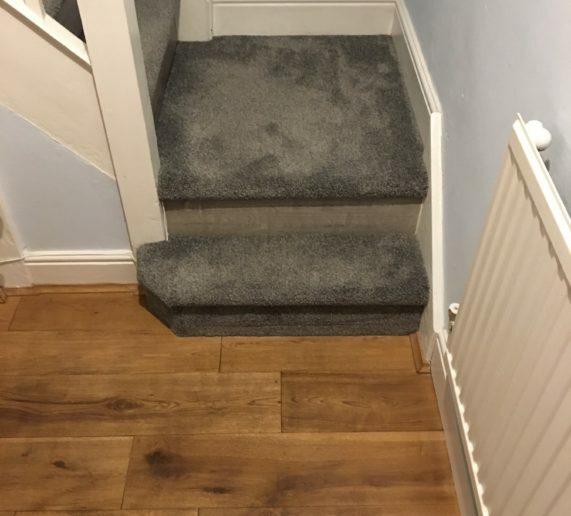 Using a combination of laminate and carpet in this way creates a stylish finish and really makes your staircase a stand-out feature in your home. The carpet used for the bedrooms is an ultra-thick carpet which feels extremely soft under foot makes each bedroom comfortable and welcoming. Finally the customer chose a ‘funky’ mosaic design to go in the kitchen and downstairs toilet. The grey design fits harmoniously into theme of the house, whilst making a bold statement at the same time. Vinyl is a convenient product to have in kitchens and bathrooms, as it is water repellent and very easy to clean. As you can see from the pictures this case study features a stylish way of covering your staircase. By using a board of laminate on the risers, instead of carpet, it makes the staircase totally unique and eye-catching. 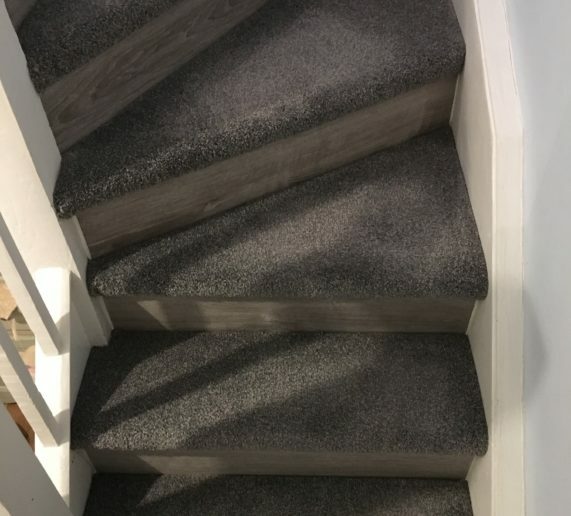 The fresh look of the grey laminate stands out as you ascend the staircase, which is then complimented well by the carpet still giving you that warm cushioned feeling under foot. Your staircase is seen and used by most people that enter your house so you want it to look good and this combination work well together.